Turkish society has been going through institutional and ideological change that has affected its social, cultural and political practices. This book examines these contemporary tensions, which have led to a re-appraisal of Turkey as a nation and Turkish nationalism as it tries to situate itself as a regional and global power. 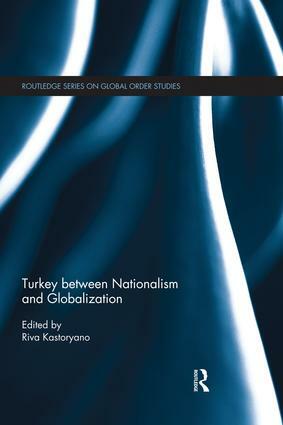 Analysing the internal and external dynamics of Turkey and the role played by nationalism, this book considers how the understanding of the nation and nationalism has changed since the creation of the Republic of Turkey, and how it has now become central to its desire to become a global power. Despite on-going negotiations about entry into the EU, an ambition for Turkey to be a regional power feeds nationalist feeling that contradicts institutional, discursive and cultural changes. Presenting interdisciplinary perspectives from experts in history, sociology, political sciences and economics, the contributors offer new perspectives on contemporary Turkey and its future. Turkey between Nationalism and Globalization will be of interest to students and scholars of Turkish studies; globalization studies, nationalism studies, Middle Eastern and Mediterranean studies, international relations, political science and sociology. Riva Kastoryano is a research director at the CNRS (National Centre for Scientific Research), and Professor at Sciences Po in Paris, France.